Of all the many strange and fascinating characters I met during my 40-year career in the newspaper business, perhaps none was more focused on the business of journalism than the late Larry Jolidon, author, editor, and original publisher of Turn Back Before Baghdad. I first met Larry, then working for USA TODAY, in the fall of 1990, when Cox Newspapers dispatched me to Saudi Arabia to report on the buildup of coalition forces preparing to oust Iraqi dictator Saddam Hussein from Kuwait. I was not quite sure what to make of Larry at first meeting. He had this head of wild, curly hair, a sly smile that made you wonder what he knew that you didn’t, and an easy way of conversing with anyone at any level of military or civilian life that I came to admire and tried to emulate. Larry was 10 years my senior, but we bonded quickly because we were fellow travelers, both of us having served in the U.S. Marine Corps during the Vietnam War and later working at The St. Petersburg (Fla.) Times, although at different times. With Larry, the priority every day was the story, whatever that story might be, and the story was always about people, not processes or procedures. Although he was incredibly competitive when he was reporting a story, Larry was always willing to lend a hand to fellow journalists. During the run-up to the first Gulf War, Larry took on the thankless task of print pool coordinator, working with the military and his often obstreperous colleagues in the print media to determine who would be assigned to what press pools when the war started. He handled it with patience and good humor, despite numerous complaints and a lot of whining from his fellow journalists. He did what he could to mollify as many people as possible, but in the end, the pool experiment was a failure because of the military’s inability to get stories back to the numerous print publications in a timely fashion. 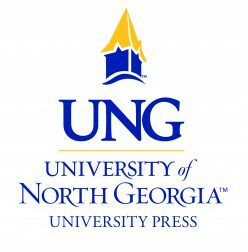 Once the war ended, Larry boxed up hundreds of stories that never saw print, sent them home, and created his own publishing firm, Inkslinger Press, to preserve them for history. The result is Turn Back Before Baghdad. Larry’s loyalty to his fellow war reporters was evident again in Somalia in 1992. Following one reporting trip to a refugee camp, Larry and several other journalists were hurrying to get back to the relative safety of the capital of Mogadishu before one of the armed militia groups that roamed the roads after dark waylaid them. Spotting something amiss on one side of the road, Larry stopped and found a wrecked SUV and another crew of journalists, some badly injured. Ignoring the approaching darkness, Larry supervised getting the more seriously injured stabilized and loaded onto the back of his truck before speeding off to Mogadishu and medical care. Larry later learned that the most seriously injured of the bunch, a French photographer, lost an eye but likely would have died had treatment been delayed any longer. Larry was an old-school journalist committed to his craft. 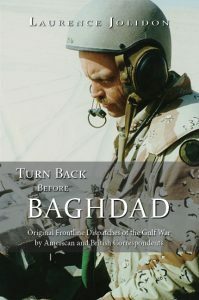 “Turn Back Before Baghdad” Cover Reveal! The long-awaited, new edition of Laurence Jolidon’s novel, Turn Back Before Baghdad, will be launching on April 8, 2017. 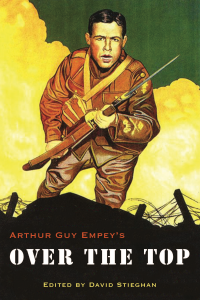 To tie you over until then, here’s the beautiful cover of this highly anticipated wartime novel.